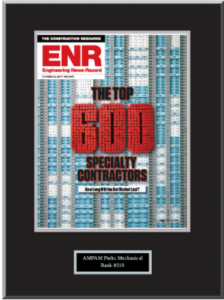 AMPAM Parks Mechanical has made ENR’s Top 600 Specialty Contractors list for 2017! A special thanks to all of AMPAM’s employees’ hard work that led us to achieve our national rank of #210. 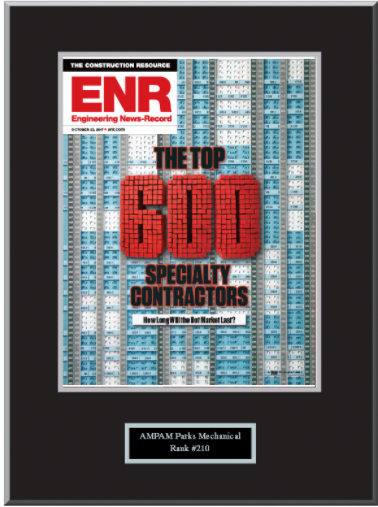 ENR’s Top 600 Specialty Contractors list involves a comprehensive review of data and analysis. It includes the rankings by revenue of the 600 largest specialty contractors in the U.S., the previous year’s rankings, company revenue, and percentage of revenue by markets.